Global Sandblasting Media Market size was estimated over USD 7 billion in 2017 and will exhibit growth of over 5.5% up to 2025. The industry is witnessing robust growth in the construction and metalworking sectors, especially in developing regions. Extensive application of sandblasting for surface texturing of concrete and rust removal on metallic and non-metallic surfaces to enhance durability and appearance will spur the demand for sandblasting media market. In the construction industry, metallic abrasives such as steel shot, steel grit, aluminum shot, etc. are used to treat pipes, steel structures, tubes etc. for the purpose of de-sanding and descaling. In addition, open-blasting activities with dispensable media such as garnets, aluminum silicate or coal slag needs to be performed for restoration and maintenance activities. Rising focus on restoring historical architectures in order to promote global tourism as well as to preserve cultural heritage will boost the global market demand in construction over the coming years. In 2017, global automotive production was recorded over 97 million units. The automotive industry requires abrasives at various stages in the production process such as desanding the engine blocks, cylinder heads, and crankshafts, descaling the forged or stamped parts such as pistons, steering knuckles, and paddles and shot peening of the gears, springs, and suspensions. These processes have a significant relevance in the automotive industry for their ability to provide precision and accuracy and provide a highly smooth finish. The growing demand for automobile components, semi-tractor trailers, trucks, agricultural vehicles, and specialty vehicles will augment the sandblasting media market demand. Stringent regulations in developed countries to safeguard the workers exposed to sandblasting procedure in order to mitigate potential health hazards such as silicosis and nervous breakdown from the dust emission from silica will likely restrain the global market. These mandates are provided by legislations such as Clean Air Act Amendments, OSHA, National Ambient Air Quality Standards, Environmental Protection Agency, etc. and controls the use of different abrasive media. 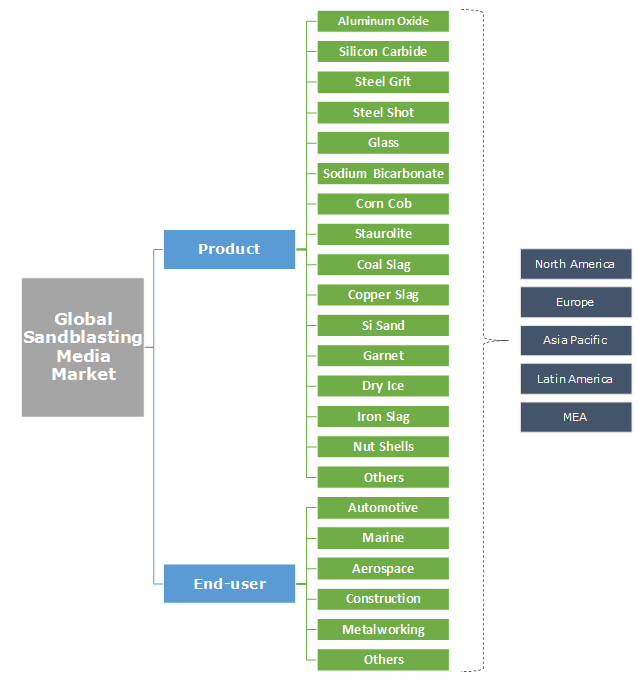 Based on product, the global sandblasting media market has been segmented into, aluminum oxide, silicon carbide, steel grit, steel shot, glass, sodium bicarbonate, corn cob, staurolite, coal slag, copper slag, Si sand, garnet, dry ice, iron slag, nut shells and others. Based on volume, the Asia Pacific steel shot segment is said to hold the maximum share of close to 13% owing to huge metalworking and building restoration activities in the region. Based on revenue, silicon carbide held the highest market share of more than 20% owing to its extreme hardness and extensive applicability in metallurgical industries, crucibles, refractories, stone polishing and grinding wheels, etc. Steel grit and coal are poised to gain moderate market share from 2018 to 2025. 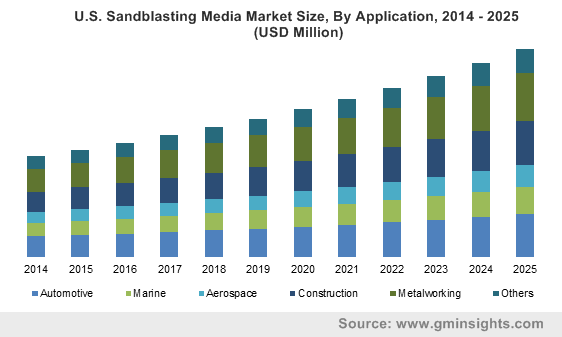 The global sandblasting media market has been segmented on the basis of end-user into automotive, marine, aerospace, construction, metalworking and others. The others segment includes paints and coatings, oil & gas, etc. In 2017, metalworking industry held a prominent share of more than a fifth of the global market. Metallic abrasives play a major role in cleaning mill scale residues, casting dirt, pressing & welding or heat treatment work piece, cleaning non-metal items surface and restoring paint grain patterns. In 2017, construction industry held the second highest market share of the global sandblasting media market and will witness growth at close to 7.5% CAGR from 2018 to 2025. The usage of high carbon steel grit during construction of steel structures for etching prior to coatings and descaling activities will further foster the sandblasting market in construction industry, thereby boosting the overall market. Considering revenue, Asia Pacific region, driven by strong industrial and infrastructural activities in China, held a market share of over 45% in 2017. In the same year India accounted for around USD 400 million in the sandblasting media industry and is said to exhibit growth with over 8% CAGR in the forecast timespan. North America held a market share of around 25% in the global industry. The use of synthetic media such as sodium bicarbonate, dry ice, glass beads in the European region accounted a significant share of the overall industry share in 2017, owing to huge restoration and refurbishment activities related to historical monuments. France sandblasting media market was valued over USD 235 million in 2017 and will grow with a decent CAGR in the coming 7 years. Abrasives Inc., Saint Gobain Ceramics Material, Opta Minerals, ABShot Tecnics, Barton International, Synco Industries, Blastech, Paul Auer, Cym Materials, Crystal Mark, GMA Garnet Pty, Ensio Resources Inc Naxos Diskus Schleifmittelwerke, Harsco Metals & Minerals, Prince Minerals, U.S Minerals, Blastrite are some of the prominent players operating in the global sandblasting media market. These market players have an extensive distribution network throughout the globe to make their products available to the end-users and enhance their regional presence. Some of the companies in the market such as Synco industries are fully integrated with the potential to manufacture both media and blasting machines along with a widespread distribution network. Sandblasting media industry has strict environmental frameworks to be fulfilled which makes it difficult for new market entrants to enter the market. Rising usage of media like silicon carbide, staurolite, garnet, and aluminum oxide are set to witness growth in the coming years. Production of automobile, consumer electronics, aerospace & defense vehicles in Asia Pacific region will further augment the demand. Lucratively increasing product demand in application areas such as maintenance of bridge structure, polishing jewelry, abrasive blasting to polish turbine blades in aerospace industry will further propel the market growth.